We were housesitting in Berkshire and decided to take a drive through the beautiful county of Oxfordshire when we came across a place called Stonor House and discovered it was open to the public. Located in a beautiful valley in Oxfordshire the Stonor Manor House is set in the midst of the spectacular beauty of the Chilterns it is a quick trip from London and well worth the drive. The famous bluebell woods and beech forests belonging to the Manor are set in an undulating landscape of gorgeous vales and hills. The landscape contains many prehistoric traces including the great dyke of Grim’s Ditch and the ancient Ridgeway and Icknield Way. The cost of a tour of Stonor House is usually £10 and it is well worth the tour. There are lots of priest hiding places and secret nooks and crannies around the main house along with the Catholic Chapel. This is one of the few places to survive the reformation of England. Stonor Manor itself has been home to the Stonor family for 850 years and has changed relatively little over that time. Complete with its own ancient stone circle, a Chapel and stunning gardens it overlooks some of the best views of the countryside. As you drive up to the house you pass by two lodges built in the 1790’s and the ‘new’ drive which was laid down in 1760. The house comes to view on the left side and you will spot a rambling warm red brick building that appears fairly ‘ordinary’ at first glimpse. Stonor house is nestled in a little dip in the valley and you will spot the family chapel on the right of the building. The house itself was built around 1200 and several changes have taken place over the years. Set in a very large deer park the house has an Italianate walled garden at the rear of the property. Stonor Manor has been the home of the Stonor family for more than eight centuries. The 12th century chapel survived 250 years of anti-Catholic legislation during the Reformation. The Stonor family were ‘recusants’ which meant that they refused to convert to the Anglican religion. In 1581 Edmund Campion and Robert Parsons, who were Jesuit priests lived and worked at Stonor using a secret printing press to disseminate the Catholic faith. In 1581 a raid on the house resulted in Lady Stonor, John (her son) and the Jesuit William Hartley and several servants being taken prisoner by the Crown. Despite the persecutions and fines which resulted from their staunch Catholiscm the Stonors continued to worship in the Chapel and enabled the local villagers to remain Catholic by allowed them to attend Mass. In the house are displays of family portraits, tapestries, bronzes and ceramics. The Gothic Revival Hall was built in 1350 and has painted on the walls the record of 34 Stonorws marriages up to the present. When we entered the Gothic Hall we were greeted by Lady Ailsa Mackay the wife of Lord and Lady Camoy’s son. It was a thrilling moment to be greeted by one of the people who lives in the Manor and calls it home. The Hall had a huge tree at one end decorated and garlanded with ornaments and lights from the families collections, with the fire burning and the warmth of the fire filling the room it was a fitting introduction to Christmas at the Manor. 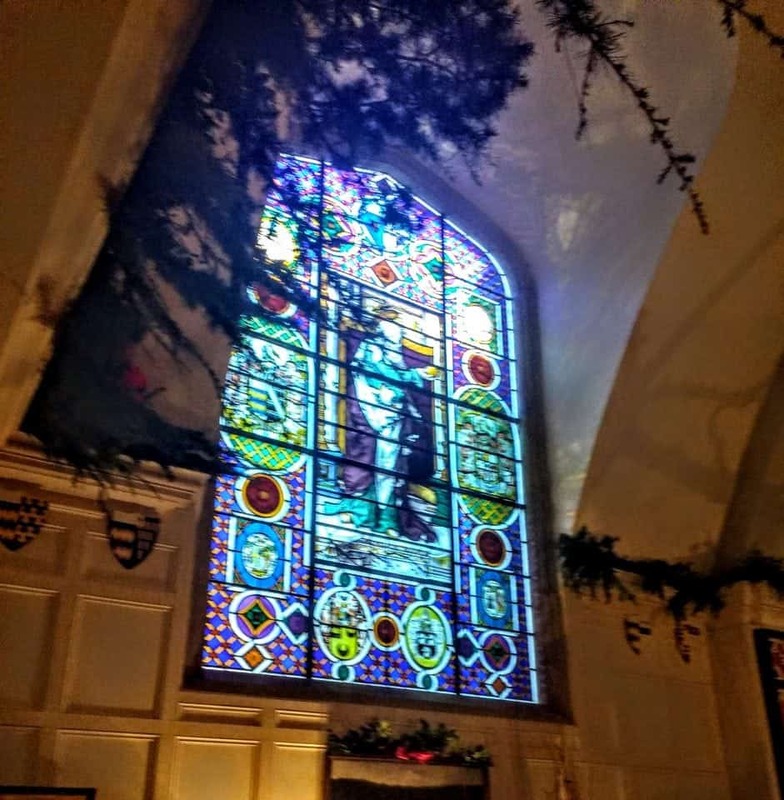 From here we moved through the tour to the Drawing Room, dappled with light and the patterns from the gorgeous stained glass windows the very pretty yellow drawing room has family portraits adoring the walls that date from the 1600’s. From the Drawing Room you move into the Blue Dining Room which has this absolutely incredibly French wallpaper with a panorama of the monuments of Paris. Handprinted in 1814 this wallpaper is the highlight of the room. Moving upstairs we came to the Francis Stonor Bedroom which has the most incredible shell bed that is so flamboyant it is extraordinary. Nobody knows where the bed came from but apparently it is still used to this day. From the bedroom we moved into the library. This room is the most inspiring to me, it holds hundreds of books, brochures, pamphlets and rare collections of recusant books 17th century pamphlets illustrating the virulently anti-Catholic attitudes of the 17th century. Portrait of Alexander Pope, Bishop Stonor and other religious family members and friends adorn the walls of the library. In Lady Camoy’s bedroom there is a very covetable 17th century canopied bed with the original hangings and gilt framework. The portraits here are all of family and the room has a delicacy of decoration and furniture that is very feminine. The Edmund Campion room is within the gable over the front porch. This is the space that was used to hide the printing press. It was here that Campion printed his infamous critique of the Protestant Church and it caused such a furore that herculean attempts were made to capture Campion and his colleagues. In 1581 he was captured, tortured, convicted and hung, drawn and quartered in December of 1581. It was soon after this incident that Lady Cecily and her son were taken into custody. Several films have been made here at Stonor Manor. The James Bond film ‘The Living Daylights’, starring Timothy Dalton, was filmed here and the Manor was used as Robbie Coltrane’s stately mansion in the film adaptation of Roald Dahl’s children’s classic ‘Danny the Champion of the World’, which starred Jeremy Irons. Other credits include ‘The Young Visitors’ and ‘A Duet for One’, starring Julie Andrews. Wandering the grounds you can take in the beautiful gardens full of lavender, topiary, ponds and fountains. You will spot the standing stones to the front of the house which are approximately 5000 years old. The house is well worth the tour, you can see that it is lived in by a family who loves the place deeply. This is not a walled off castle or a simple historic tour, this is a warm and welcoming home that greets visitors with a smile and a handshake. If you want to visit a quintessentially British village check out Sonning where all the celebrities are flocking – George and Amal live here so does the Prime Minister of England and quite a few others.